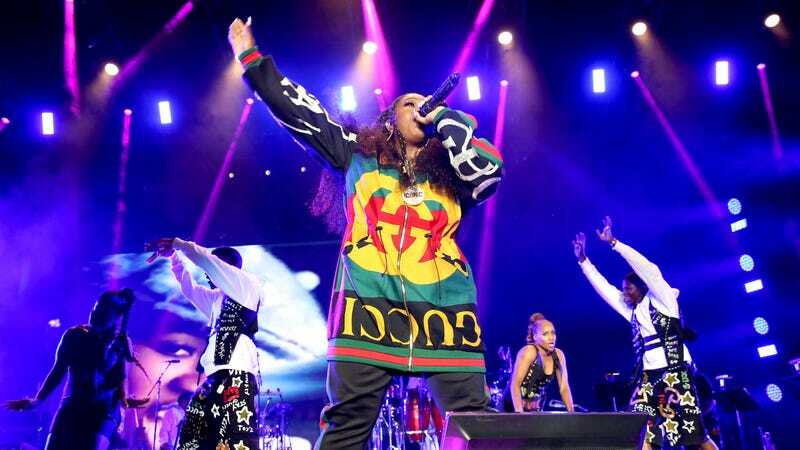 Missy Elliott performs onstage during the 2018 Essence Festival - Day 2 at Louisiana Superdome on July 7, 2018 in New Orleans, Louisiana. We’ve been buzzing about the renaissance of the Harlem-based designer known as Dapper Dan so long, it’s hard to believe that his much-anticipated collaboration with former nemesis Gucci only launched this week. After all, we’ve been seeing teases for months: in Beyoncé’s tour wardrobe, on any number of red carpets, and most recently, on both Missy Elliott and Mary J. Blige onstage at the 2018 Essence Festival. But now, the looks—which reference Dan’s iconic bootleg designs from the ’80s and ’90s as well as classical motifs used by Gucci’s current creative director Alessandro Michele—have finally made it to market. The line, which went live on Tuesday at Dan’s Gucci-owned atelier and on the label’s website, riffs on Dan’s hip-hop Harlem streetwear aesthetic with a decidedly Italian flourish. Think tracksuits, fanny packs and medallions—but with classical Greek, Italian and Latin iconography. But owning a piece of fashion history won’t come cheap; prices range from $100 for women’s wool socks to $7,980 for one of Dan’s leather logo-emblazoned jackets. The accompanying campaign was based on archival images from Dan’s golden era, shot by Ari Marcopoulos and featuring Harlemites wearing the collection. Dan, who starred in a campaign announcing the collaboration last fall, isn’t featured this round—but like Gucci, his signature is all over it.